School dental nurse and patient at Waipu school. Photo: John Pascoe, circa 1942. If you didn't drink your daily school milk, eat an apple, and regularly brush your teeth, a trip to the school dental clinic could mean some serious repair work. The New Zealand school dental service was a world-first, providing preventive dental care to primary school children from clinics located on school grounds. Rather than take the children to the dentist, the dentist was brought to the children. Considered impracticable by many, the service was largely ignored internationally until it began to receive some international interest for many decades until the 1960s and 1970s. Such is the price of succeeding by swimming against the stream and getting spectacular results. Colonel (Sir) Thomas A. Hunter, Director of the New Zealand Army Dental Service in the 1914–18 War proposed the idea of a dental school program staffed by young women trained in preventive dentistry in 1921. In the same year, a dental school to train these dental nurses opened in Wellington. With the election of the First Labour Government in 1935, the program was rapidly expanded with new facilities in Wellington and additional schools being opened in Auckland and Wellington in the 1950s. In the post-war baby boom new dental nurses could not be trained fast enough to tend to the growing student population until new hiring and the new schools were built. The school dental nurse in her "whites" and red cardigan (at least that's how I remember them) and her clinic (a.k.a. "the murder clinic" to generations of kids) quickly became a part of the school community, though children tread rather warily when in the vicinity of the clinic lest they be summoned inside for one of their twice yearly check-ups. This was no statist experiment in the compulsory torture of the young: parental permission was sought and widely given. By the mid 1970s, more than 60 percent of preschool children and 95 percent of primary school children were voluntarily registered (by their parents!) with the school dental service, underscoring the high participation rate by the community. Significant improvements in dental health were registered over the longer term. For instance, in1925 there were 78.6 teeth requiring extraction for every 100 teeth that were restored. By 1974 this figure was reduced to 2.5 extractions per 100 restorations. Although the data is not to hand here (I haven't bothered to search for it), one can expect even further reduction occurred from the mid 1970s to the present. Thus, many young adult New Zealanders today retain a full set of teeth, many with few fillings, in strong contrast to the first half of the twentieth century when many of the same age cohort had lost many or even all their teeth by sometime in their twenties or thirties. Although there may have been a tendency in past decades of the school dental service to "drill and fill", there has always been a strong emphasis on dental education to prevent cavities in the first place. Today the school dental nurse is known as a dental therapist. For secondary school students, the First Labour Government in 1947 initiated dental benefits for those up to the age of 16 under the Social Security Act 1938, with the government sub-contracting treatment to be conducted by private dentists in their clinics. Prevention is always better than cure; we have school dental vans tootling between schools here in Vic, thanks (no doubt) to the NZ forerunner. What would be nice is a list of Dental Nurse students from the Chrisychurch School for Dental Nurses. The I might be able to locate an old friend....who of course was a dental nurse. Thank you for sharing the information on the school dental clinic. A friend was showing me around Pine Hill school in Dunedin recently, pointing out possibilities for community orchard sites. I spotted this small building off to the side, and he said, much to my surprise, that it was for the on site dentist! Growing up in the United States, I and my family would have benefited greatly from having a dentist at my school. My teeth are full of fillings, and it took many years for our family to pay off the dentist bill from the 6 children. I could tell immediately that some people were a little hurt…all people with mba’s. Hey, sometimes the truth hurts! But even then – that’s all watered down now cause of Triberr. Jayne, we didn't wear shoes to school in those days. 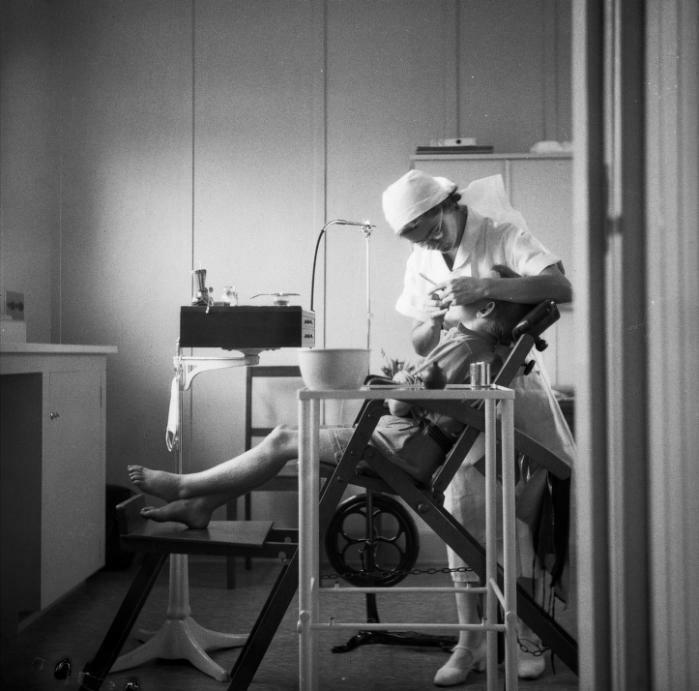 This was torture of the young: those dental nurses in the 1960's practised on all of us. All the primary students called it the murder house. Parental permission? the dental nurses went through the school roll. My parents didn't know my brother & I had been to the dental clinic until we came home from school. My father had to phone the school and tell the dental nurse to leave my teeth alone. In the 1960's we did not have the food & drink there is today to cause dental decay. I, and many others of my generation, have terrible memories of those dental nurses. It was the 'murder house' not the 'murder clinic'. Yes, I stand corrected - it WAS the "Murder house", LOL. The 1960's Dental Nurse programme set me up for a lifetime of Dental misery. 1st I attended a Catholic school in the South Island. We had to attend the clinic at the State school. Owing to the peculiar anti Catholic sentiment in a Scottish Presbyterian/Anglican town that usually involved bullying and school fights the whole mile home. As for some reason my mistreatment usually ended at school close. The nurses far from the friendly young women in white came across as nasty violent creatures, who just wanted to cause me pain. My mother has told me I have came home with claw marks on my cheeks from been held down so they could administer their damned needle. Why? to put a filling in a baby tooth! This treatment was a systematic abuse of defenceless children. And as the eldest in my family the name stuck and my siblings suffered similar experiences. My Parents eventually took me off the programme, but I was not told that. Instead the 'professionals" made me feel that it was my fault for been so un co-operative. For those of you who had good experience of this abuse. I got one question..how? I took flouride and brushed but still was subject to physical and mental torture, owing as much to a warped social system as to the bad training those girls had. At last in my 50's I got the promise of Dentures. Why so long? Fear, poverty, shame and whole host of difficulties which the school dental abuse programme set me up for. Feel free to answer me. Because I am not going to let it lie. can u please suggest regarding initiation of the programme... not in a large scale but how to initiate...? Dan, I had exactly the same thing this torture in Auckland during the 1960's. ruined my life as well as my teeth, Ive spent a fortune on them over the years, and they're still a mess. This had set me up for a lifetime of total misery as you yourself know already. I feel we ought to be getting FREE dentistry. The New Zealand Journal - A journal covering anything and everything about New Zealand - Aotearoa by a Kiwi in the diaspora. Topics covered may include: history, culture, politics, science, sports, business & economics, or whatever comes to hand. My Life in Postcards blog - my life expressed in postcards, perhaps, and living the postcard life.